Interzone devoted a special issue exclusively to Jason Sanford’s stories. In this interview, he delves into the nature and influences of sci-fi strange. 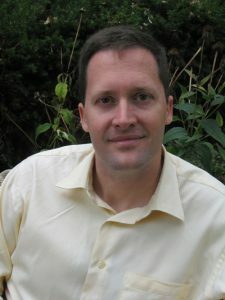 JASON SANFORD: I started using the term a few years ago after David Hartwell and Kathryn Cramer described one of my stories as “new weird SF.” That comment tickled me since I’ve long been a fan of the New Weird movement, with authors like Jeff VanderMeer and China Miéville ranking among my favorite fantasy writers. But the comment also set me to thinking about the science fiction authors who excited me the most. I wondered if there was a trend here, decided there was, and eventually started calling it sci-fi strange. To me, sci-fi strange stories exhibit well-crafted language, a strong sense of wonder, and reflect the truth of our multicultural world. Sci-fi strange stories cross back and forth across the boundaries of what is scientifically and realistically possible, often flirting with the fantasy genre. But these stories aren’t fantasy. Instead, they’re an updated version of the “literature of ideas” theme within the science fiction genre. I see sci-fi strange as science fiction for a world where the frontiers of scientific possibility are almost philosophical in nature. CS: What are the genre, story, and author influences for sci-fi strange? JS: A number of authors I love create what I’d call sci-fi strange, including Paolo Bacigalupi, Aliette de Bodard, N.K. Jemisin, Ted Chiang, Yoon Ha Lee, Ken Liu, Nnedi Okorafor, Rachel Swirsky, Lavie Tidhar and Caroline M. Yoachim, among many others. I’d say Paolo Bacigalupi is the prototypical sci-fi strange author, as exhibited by many of his short stories along with novels like The Windup Girl. Aliette de Bodard’s Xuya continuity of short fiction is also very much sci-fi strange (there are many great stories in this series, including her novella On a Red Station, Drifting). Most of Ted Chiang’s fiction feels like sci-fi strange, as does Lavie Tidhar’s Central Station stories. I’d also place within sci-fi strange Nnedi Okorafor’s novella “Binti,” which is pure SF, and Who Fears Death, which actively blurs the lines between fantasy and SF in very exciting ways. Who Fears Death actually ties in with an interesting point, which is that many of the authors I’ve named go back and forth between the science fiction and fantasy genres. For example, some of Ken Liu’s best short fiction is pure science fiction, yet his first novel is an epic fantasy. Makes me wonder if authors who defy being pegged down to a single genre with their writings are also people willing to defy the accepted tropes of science fiction. CS: Give us some examples of premises, plots, and characters for sci-fi strange. My new novelette “Blood Grains Speak Through Memories” (in Beneath Ceaseless Skies, March 2016) features a world where bio-technology is embedded in all aspects of the environment, allowing the lands around us to communicate and protect themselves from harm. The story’s main character is Frere-Jones Roeder, a woman who “anchors” the land she lives in by being connected to the environment’s bio-technology and responding to the land’s needs and desires. A connection which, as Frere-Jones learns to her horror, can lead her to do truly horrific acts. “Blood Grains Speak Through Memories” is grounded in science yet reads in many aspects like fantasy, such as through the inclusion of technology-created fairies. I believe this mixing of tropes creates a sense of wonder and a contemplation of ideas which (I hope) resonates with readers. CS: Does sci fi strange fit into the New Weird movement? JS: Can this be the part where I disavow everything I’ve previously said about sci-fi strange? I use the term to describe the type of SF I both write and enjoy reading, but it’s totally pretentious to try and name a new subgenre by one’s self. Whether or not sci-fi strange truly exists and is useful as a term is for other people to determine. Damien G. Walter recently wrote an essay on the “8 Tribes of Sci-Fi”, which I highly recommend people read. His point is that there are multiple genres within science fiction and fantasy, which he calls communities and cultures, and that the genre will likely continue to break into these distinct subgroups for years to come. I both agree with his view of SF and see this fragmentation as a great thing. All the genres within SF contain multiple worlds and ideas and beliefs. There’s room for everything we love within the universe of speculative fiction. In addition to sci-fi strange I also love space operas and dystopian SF and New Weird and countless other types of speculative fiction. But don’t pretend that these labels ever take the place of the stories themselves. Genres and subgenres exist to help readers and fans find stories which resonate with them. Nothing more or less than that. So is sci-fi part of the New Weird? I’d say that’s a call for others to make. And if a term like sci-fi strange helps some people find stories they like, then more power to the term. And if it doesn’t then the term is beyond worthless. CS: Why do your stories connect with Interzone readers much more than other magazines? JS: I wouldn’t say my stories connect more with Interzone readers. Instead, I’d say my stories received their first big exposure thanks to Interzone and editors Andy Cox and Andy Hedgecock (along with Jetse de Vries, who found my first Interzone story in their slush pile). 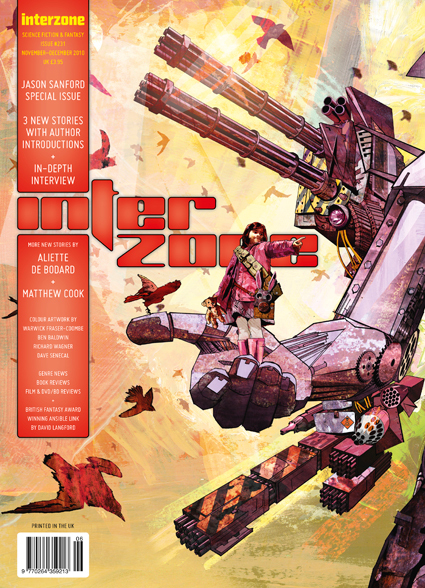 Interzone has long been known as a magazine which takes chance on new writers and I’m thrilled they took one with me. In regards to your question, I do find it amusing that my biggest exposure as an American SF writer was initially overseas. I’ve published more than a dozen stories in Interzone and have had my fiction reprinted in a number of languages, including Chinese, Spanish, French, Russian, Polish, Hungarian, Italian and Czech. I even write a monthly column for the Czech SF magazine XB-1. And most of that happened before I began publishing stories on a regular basis in the U.S. But in the last few years I’ve found a readership in the U.S., with magazines like Asimov’s Science Fiction and Apex and Beneath Ceaseless Skies printing a number of my stories. These days most of my short fiction is first published in the U.S., followed by reprints and translations in other countries. CS: In 2007, your career took an abrupt turn from literary to speculative. What happened? JS: I’ve always been a science fiction fan. I grew up on science fiction, worshipped as a kid at the SF altar, and dreamed about one day being a SF author. Yet I’ve also long been a fan of other types of fiction—in particular Southern Literature with its beautiful cadences and tragic themes and magic realism form of storytelling. I can still remember where I was when I first read stories by William Faulkner, Zora Neale Hurston, Flannery O’Connor, Cormac McCarthy and so many others. Because I grew up in the American South and love Southern Literature I’ve also written within that genre, and even founded a literary magazine called storySouth which focused on the genre. But I eventually realized the best way to write the stories I needed to tell was by generally staying within the SF genre. CS: What’s the criteria for the Million Writers Award? Who are the judges? JS: The Million Writers Award grew out of my work on storySouth, which was one of the earliest online literary journals. At that time many people ignored or put down online fiction. The award was an attempt to bring more exposure to authors publishing online. Obviously the situation has changed in the 12 years since I started the award—now online and e-publishing are the equal of anything published in print, and actually bring in more readers in many cases. I no longer run the Million Writers Award or publish storySouth. Spring Garden Press, a not-for-profit independent literary press located in Greensboro, North Carolina, now manages both the journal and the award. But the way the award works is that online editors and readers nominate their favorite stories each year. The only criteria is that the story must have been first published online. Then a group of judges pick the finalists and the general public votes on the overall winner. CS: What’s on the horizon for Jason Sanford? JS: I’m completing work on a young adult SF novel which is very much sci-fi strange. I’ll begin submitting the completed novel to agents in the next few months. I’m also writing a number of short stories. My novelette “Toppers”—which mixes together time travel with a weirdly strange version of New York City—will appear in the August 2016 issue of Asimov’s Science Fiction. This will be my fifth appearance in Asimov’s and I’m eager to see what readers think of the new story. This entry was posted in Like Show Business and tagged Carl Slaughter, Interzone, Jason Sanford by Mike Glyer. Bookmark the permalink.